"Wonderful products and fantastic and quick service." Personalized diaries and journals make a unique and very affordable gift for that person on your list that you always struggle to find something suitable for. Our photo notebook features sturdy front and back cover, ruled or blank pages and a durable black spiral binding. To create your personalized notebook, choose photo notebook from the menu, select template you like for the cover, inside front, inside back and the back of your notebook and upload pictures from your computer or favorite photo-sharing site to our builder. You can then use our online editing tools to drag and drop pictures and add your custom message to the template. With all these options, you’re sure to create the notebook that’s right for you and for your gift recipients. 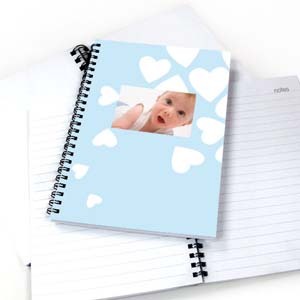 Inexpensive paper notebook gifts are a great giveaway for business customers, wedding and birthday party favors, and reunion gift and keepsakes for friends and family members.